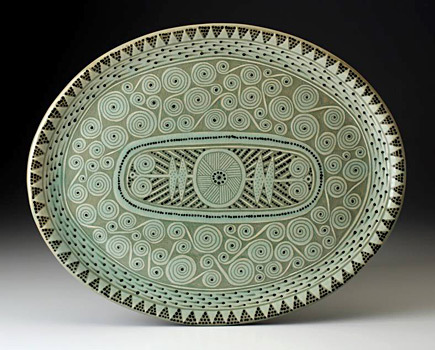 sgraffito and slip trail, celadon glaze. 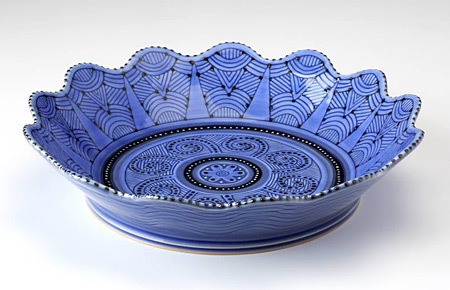 Hand thrown altered stoneware; sgraffito, slip trail, cobalt blue glaze. 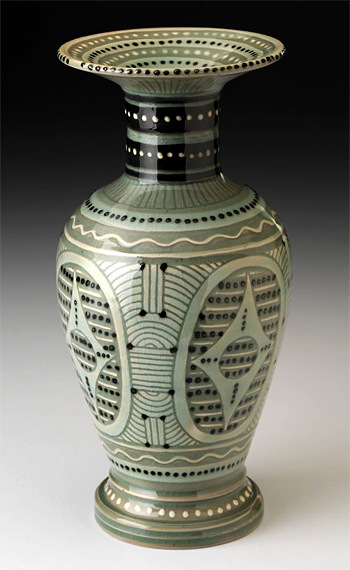 I discovered ceramics by accident while I was a painting major at Massachusetts College of Art in Boston. I had been drawing and doodling my entire life and I thought that painting would be a good fit for me. But there was something missing. When I took a wheel throwing class to fill a requirement, I wasn’t expecting much. But as soon as I started making pots, I was completely and utterly hooked. There’s something about the tactile quality of clay, the magic of throwing a pot on the wheel and the enduring functionality of the finished piece this is what I had been looking for all along. And I could still draw on the the pots! I have been a potter since graduating from Mass Art in 1994. I make pots that are sturdy and user-friendly for everyday use. I like the idea that my work can become a part of your everyday life and that it brings a little bit of beauty into your morning cup of coffee, a sandwich at lunchtime, or a dinner with family and friends. I hope my pottery brings you many years of enjoyment.